Following their last meeting in June 2013, Hart council will once again be playing host to representatives of Thames Water, to discuss the ongoing problem of local flooding. Hart councillors will attend the meeting and are expected to be joined by figures from Hampshire County Council Highways and the Environment Agency. Denise Kinsella, a member of the ‘High Level Team’ from Thames Water states, “We will be attending a council meeting on 20th January along with other agencies to discuss the flooding in the area. This meeting is taking place in Hart District Council Offices, Harlington Way, Fleet, GU51 4AE, at 2pm. I’m aware some residents are attending, but it’s advisable to check with the council about the public access to this meeting. Speaking yesterday, local Councillor Gavin Evans confirmed the meeting was to take place and stated that “this is not a public meeting”. When questioned about this, he stated, “It’s ‘invitation only’, so most likely residents that have had long-running issues will have been asked if they want to attend”. Sadly this does not seem to be the case in all instances and many local people suffering from ongoing flooding issues have received no invitation to this meeting. Councillor Evans also goes on to say, “If you have any issues you’d like me to raise I can do so (as a Hart Councillor). In terms of specific locations, they are already looking at: Albert Street, Fleet; Burnside, Fleet; Beaufort Road, Fleet; Avondale Road, Fleet; Brandon Road, Fleet; Crookham Road, Fleet; Old Hitches Lane Pumping Station”. The meeting is thought to include proposed plans by Thames Water, to build a new pumping station and storage facility, to replace the current failing one on Edenbrook. This will be situated on the land opposite Calthorpe Park School, land is well known for it’s frequent flooding. 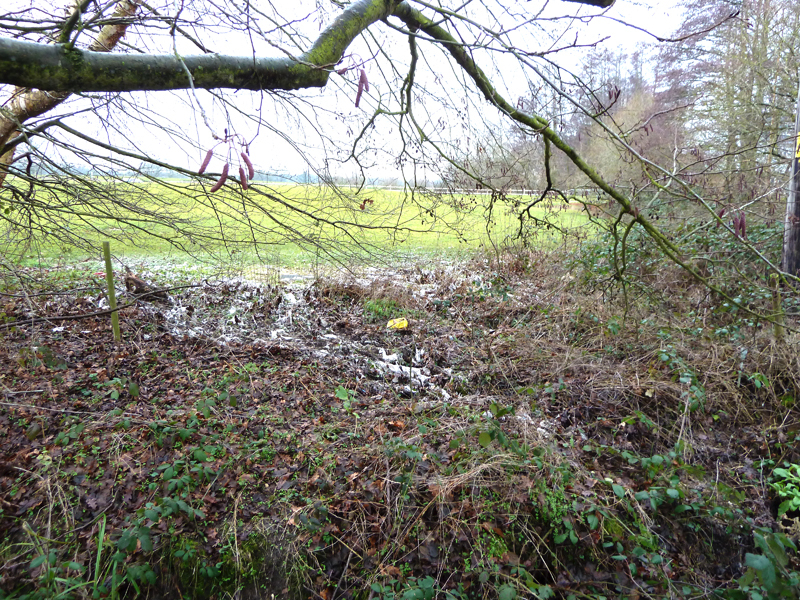 This area currently contains huge underground containers to store the overflow rainwater and unfortunately is often heavily contaminated with sewage after heavy flooding, leading to a foul stench as well as a host of waste products clearly visible over the land. BELOW: Pictures from flooding in 2010 show the proposed new pumping station site, opposite Calthorpe Park School. 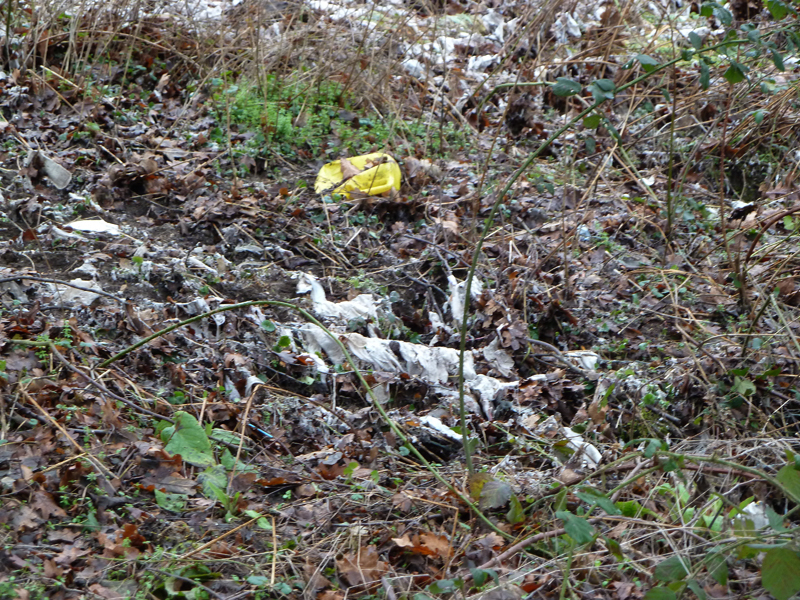 White sewage contamination can clearly be seen strewn across the land. Ms Kinsella also confirmed the removal of the existing pumping station, stating “The existing pumping station will be decommissioned when the new pumping station is up and running. We still expect the work to take about 12 months, but hope the residents will have the benefit before then.”. So, as local residents continue the struggle of cleaning up the wreckage of their homes from yet another round of sewage flooding, out of their own pockets, we have no choice but to sit and wait for possible outcomes and proposed plans to come to fruition.